Are you looking for a quick way to generate leads online? Many companies find that their traffic numbers are lagging behind expectations and they need to get those numbers up quickly. Or, they are launching a new website and want to generate as much traffic as possible in a short time period. A focused, well-designed PPC campaign offers a way to get traffic numbers up in a short time period. But, before you jump into a campaign, you need to understand what PPC is and how it works. PPC stands for pay-per-click. With this internet marketing model, your company places an order for a PPC campaign with an online advertising company. The advertising company places your ad on different sites, usually related to your industry. The ad may also appear on search engines. Each time a person clicks on any ad, your company pays a set amount based on the keyword and ad placement. Define keywords - Each ad you place will have a keyword associated with it. It is important to find keywords directly related to your company's niche and industry. When doing research for your keywords, consider synonyms of the words you come up with. Look for both short-tail and long-tail keywords. You need to find keywords with plenty of traffic. You want to avoid keywords with an overwhelming number of contenders. Research keywords using Adwords - Once you have a list of potential keywords, you need to check each one through Google's Adwords.You need to look for keywords which have a good amount of traffic, but do not have a high level of competition. You also want to find keywords that have a pay-per-click price. All of this information will allow you to narrow your keyword list to just a few. 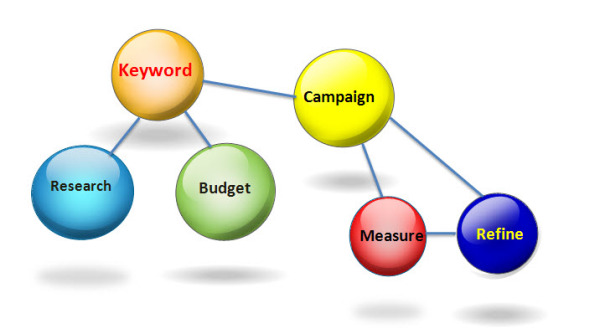 Establish a campaign budget - Once you know about how much each of your short-list keywords will cost, set a budget. You want enough budget to generate traffic but setting no limit is potentially disastrous. You can also set up a separate budget for each keyword or ad. This will keep your budget under control from an out-of-control situation. Create and execute the campaign - When you set-up your ad, you select your keywords and give the sales copy for the ad. You set your budget and any other limitations you want on the project. The company will execute it for you. Measure success - You need to watch your ad campaigns carefully. Which ads are the most successful? Which keywords have the highest click-thorough? Which ads generate the most leads? Which ones give low-quality traffic that you have trouble converting to leads? Are you seeing higher traffic numbers? Are seeing your lead count increase? Make refinements - From the data you pull after the campaign begins, you can begin to tweak things to increase your conversion rates. If one keyword is hotter than others, then put more budget towards it. If a keyword gets plenty of traffic, but few conversions, it might be ready to limit its budget or remove it. When you have a successful campaign going, it is important to sustain it. That means evaluating things routinely and providing additional budget to keep the traffic flowing. PPC is a quick way to generate leads online with the proper preparation and campaign set-up.